Our country has great firefighters and rescue personnel. And we have diligent city management teams and advanced weather prediction systems in government and private news media. But these things only offer a certain measure of protection from the random chaos of a serious flash flood event. The bulk of the work for keeping yourself and your family safe comes down to you. "Resist the normal urge to rush home immediately during a heavy rainfall event. Sometimes getting to high ground and staying put for a while is a safer alternative for you and local rescue personnel." Emergencies of any kind favor those who have taken some steps to prepare themselves ahead of time. The first, most general, thing you can do is to get to know your local landscape. Find out where the local streams and drainages are and where the roads you drive the most intersect these potentially dangerous areas. Your local authorities (a public department such as city wastewater or flood control or a local river authorities) have staff that can explain the rainfall runoff patterns to you. It is especially good to know of hazardous low-water crossings and low-lying roads near creeks and rivers. While these areas are not often publicized, your local authorities will generally share this information with you if you enquire. See a local hazard map example developed by the City of Austin, Texas. 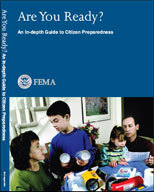 The single most important thing you can do is to be mentally prepared for a rapid onset event. Make no mistake about it. A large rainfall hitting an urban area can turn it into a "war zone" and you don't know how bad it's going to get once it starts. There are always complicating factors and every rescue effort draws precious resources from a very limited supply. Sometimes the best thing you can do is respond rapidly to keep yourself from immediate danger, then switch gears and "shelter in place" - waiting out the few hours it takes for the situation to stabilize. Resist the normal urge to rush home immediately. Chances are, you won't really know how bad things are until its too late. Conversely, many flash floods only present grave dangers for a period of hours before subsiding. Use your cell phone to locate family and insure that everyone is safe where they are. But don't linger to avoid overloading the network needed for recue and relief personnel during a large scale event.